Another little job that’s in your face! What I mean by that is that the main thing you look at in the car, besides the road, is the dash area. If the dash looks tired and old then it just feels like that. I knew I had work to do in that area and this weekend was the result of that work. This dash area was a job I have been thinking about for a long time now, and the main cause of concern was the Ammeter to Volt meter conversion for my dash that I wanted. My replacement American Autowire loom did not recommend or even allow the fitting of the ammeter as a standard option straight out of the box. My 100amp one wire alternator would be pushing out over twice the 47amps that the original produced. 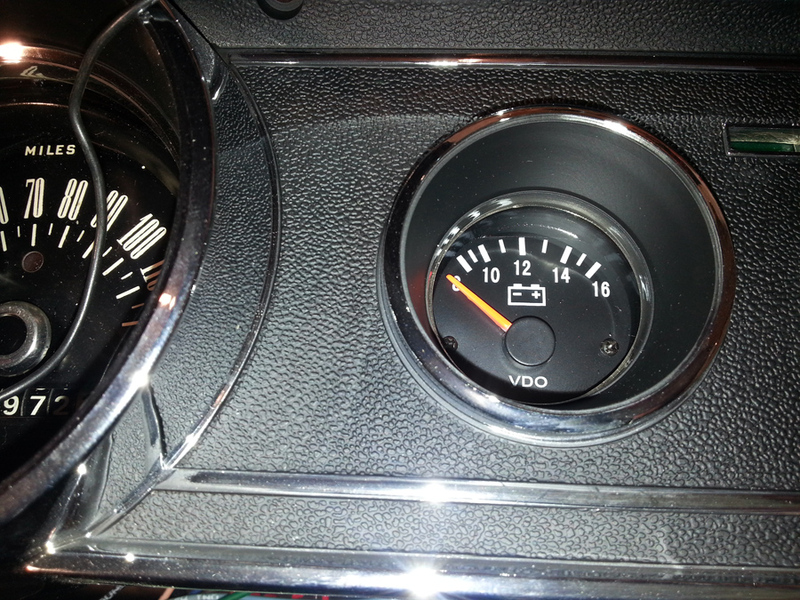 That on its own was enough to make me nervous and I didn’t want that gauge there for a little safety. My options were; I could leave it in place as a dead dial, or fit a clock there, not ideal but an option never the less. My research has led me to a couple of people who have done similar and got them working, so it’s hats of to them for doing it. But in my opinion they just didn’t look right for the era of the car. I eventually found a VDO model that was for outside or inside case mounting. I took the plunge and bought it from the far east. It took me a little over five hours to complete the task, but I was checking everything was going to plan before I started the drill work etc. The full guide and walkthrough of the process I took can be found under my Photo Menu – Inside The Car – Ammeter to Voltage GT Dash Conversion or click here. There is nothing worse than having half the dial showing. The finished result is I think it looks great and above all it works and a better gauge than the Ammeter fitted as stock. While I had the unit apart I also reconditioned the dials, the orange fluorescent paint was a perfect match to the original colour that could be seen at the top of the needles and wasn’t faded. Sunday, the rain has stopped and there is a little sun if you look hard for it. So I managed to push the car out and rub down some door pillar work I started a couple of weeks ago but again not aas exciting as the dash work but it all needs to be done regardless. Let me know what you honestly think of the conversion, was I right to stay black and white or even have the needle going up instead of hanging down? This entry was posted in Car, Photo's and tagged ammeter, amps, conversion, GT dash, lens., Mustang, paint, process, volt meter. Bookmark the permalink. 12 Responses to How Dashing…. Thank you, I was well pleased with the results. What a lovely dash! Great job once again. Thanks Debbie. It took a while to fit but it was worth it. I can’t wait to get it fitted into the car. Brad has work to do on Michael’s speedometer in the ’72 Cutlass. He followed us when we dropped him at college about a month ago. We were doing 70ish most of the way and his dash read 90-100+ MPH. Don’t know how he would explain any part of that to an officer! LOL Ah the joys and quirks of Hot Rods!! Nice job Mart. looks fine to me. Thanks. I was pleased with the outcome.